9 April 2015, Abu Dhabi: The message of the importance of health and wellness could not have come at a better time. Celebrated each year on 7 April, World Health Day is a global awareness, an initiative of the World Health Organisation (WHO). In celebration of this important awareness campaign, and in striving to meet their commitment towards improving the health care service in the UAE, Health First Pharmacy, the retail arm of Planet Pharmacies, officially opened the doors of their flagship branch in Abu Dhabi today. The red carpet and ribbon cutting ceremony was headlined by H. H. Sheikh Saqr Bin Humaid Al Qassemi, along with other key players within the health and medical sector including representatives from the Ministry of Health Abu Dhabi. 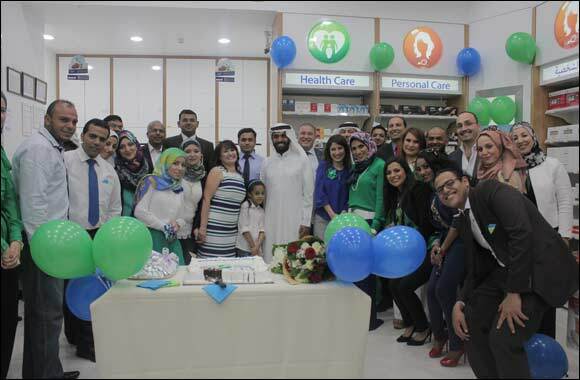 Health First Pharmacy offered its customers routine health checkups including blood pressure and blood glucose during the inauguration of its new branch today in Deerfields Townsquare Mall, Abu Dhabi. “These are two of the most important screenings because the key to preventing cardiovascular disease is managing your risk factors, such as high blood pressure, high total cholesterol or high blood glucose. Serving the healthcare sector we have an important role in educating the public the importance of regular checkups regardless if you feel any symptoms or not,” Dalara Surkari says, group marketing manager for Planet Pharmacies. Health First Pharmacy, the retail division of Planet Pharmacies L.L.C., a Joint Venture between Global Investment House and Julphar Pharmaceuticals, is expanding throughout the region with a total of 180 new shops slated in 2015. The growth plans will cover new 50 outlets in the United Arab Emirates, 25 shops in the Sultanate of Oman, and 80 stores in the Kingdom of Saudi Arabia. “We’ve been hosting the same outreach programme for the past six months across our pharmacies in Dubai, wherein certified healthcare providers are available at the pharmacy at each branch opening, and offer basic screening tests free of cost. This is one of the many ways that we try to give back to our loyal customers.” Surkari adds. During the pharmacy’s inauguration today, Health First Pharmacy served nearly 500 customers with screening tests. Other activities offered are anti-stress massages, BMI analysis, nutrition and fitness advice, mini-mani, make up, and kids activities provided by partners including L’Oreal, Rouji, SOSKIN, Jumasan Beauty Centre, N Style International, Urban Male Lounge, FabbyLand and Exiom Fitness.